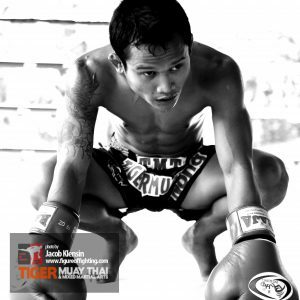 Tonight (Oct. 18th) is a BIG night for Tiger Muay Thai & MMA training camp in Bangkok! Nong (fight name Talayhod TigerMuayThai) is fighting at Rajadamnern Stadium against Ngaoprajarn Chuwattana. This is a rematch of their fight last month, which Nong won by decision. Both fighters weighed in this morning at 107 pounds. The winner of this fight will get a title shot at the Rajadamnern stadium 105 pound title – one of the most prestigious title in Muay Thai!